Directions: Spread peanut butter on each piece of bread. Slice banana length wise (see image) and place on only on 1 slice of bread. Cooking Directions: Melt butter in shallow frypan on medium heat. 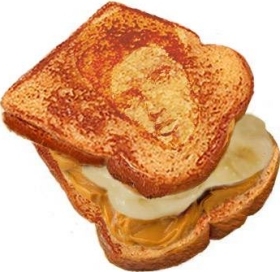 Place sandwich face up for approximately 3 minutes or until golden brown. 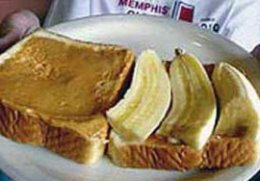 Cover the peanut butter slice over the banana. Cover frypan. Continue cooking for 2 minutes or until the peanut butter and banana has melted. Nancy worked for Elvis from 1967 until his untimely death in 1977. Read her stories of what those years were like, of what the routines were at Graceland, and what it meant to be close to Elvis and his family on a daily basis. Read the sad account of her rushing upstairs, after a frantic call from Ginger Alden, and finding him on the bathroom floor. Elvis’ Cook Pauline Nicholas continued cooking for the Presley family after Elvis died. 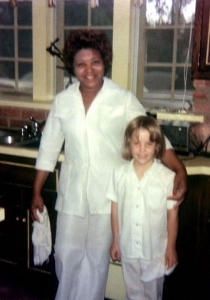 Last Christmas, when Lisa Marie and her mother, Priscilla stayed in Memphis they asked Nicholson cook for them from her unique Southern styled recipe book. Nicholson was featured in the movie This is Elvis, and loved to talk about her time with the King of Rock and Roll, whom she called Mr. P. Nicholson was introduced to Elvis in the mid-1960s by a neighbor, Cleo Smith, who knew she was a good cook, said her son, Ossie Nicholson Jr.
Pauline Nicholson Died July 7 2005 of cancer. She was 76. Family history of cook Pauline Nicholson Her full name is Willie Pauline Nicholson. started working for Elvis, August 1964 as his cook and maid. Like some of his other help, she was originally from Mississippi. Paulines husband, Ossie, also worked for Elvis for a long time as a night-time security guard, usually watching the back gate entrance. He retired several years ago and there is a very large banner hanging in their living room from Graceland with everyone’s signature on it. Pauline worked various shifts, depending on what the needs were at the time. She had been working nightshift the morning Elvis died, and was one of the last people to see him alive. She had taken him a glass of water up to his room after he had come in from playing racquetball that morning. She then left when Nancy Rooks came in to relieve her around six or seven a.m.
Pauline was also in the recent special “Elvis by the Presleys.” Up until her recent hospitalization, she regularly continued to cook for Lisa Marie or Priscilla whenever they would come to Memphis. She last cooked for them in December, which was when the TV special was filmed, and of course she and Ossie were featured in it cooking for Priscilla and Lisa Marie.